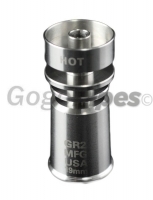 This titanium nail is domeless and works with 18mm stem. Your pipe should be stemles 18mm. Its femal nail. Pros: Was just the piece we needed to complete our rig, works great, easy to heat up, and well worth money.